Evenin' friends! I hope your summer has been full of fun and sun! With so much going on, I took some time out to get back in the kitchen, where I always love to be, (obviously, right?) to make this bread that my daughter in law shared with me! It has certainly been a busy summer around here! For those who don't know, my son, daughter in law and twin littles (grandbabies) moved here in May, which explains my periods of absence. I am so busy watching them grow, playing, snuggling, and enjoying them and the kids, I can't seem to find a balance. However, I am missing my website and friends, I will figure this out, I am new to this "having my littles near me" thing. It put me in full on Nonna mode!! Here is who has been blessing my life! 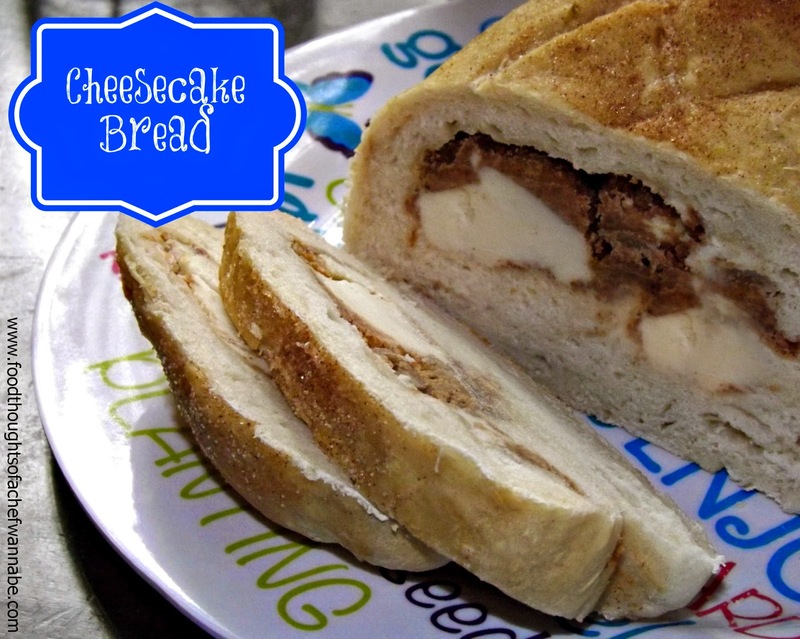 Let's get to this delicious cheesecake bread that was inspired by a recipe my daughter in law used to make at a pizza shop she worked at! Add yeast to your warm water. Remember if the water is to hot it will kill the yeast and if not hot enough, it will not activate the yeast! You can do this! Just sprinkle the yeast on top and let it sit for 3-5 minutes until it becomes foamy or scummy on top. While that is happening combine your flour, salt, sugar and vanilla. Add yeast mixture when it is ready. Using a dough hook on your stand mixer let it "knead" for 5 minutes. Yes, 5 minutes. If you don't have a stand mixer, knead until the dough is smooth and gorgeous! Oil, butter or spray a large bowl with nonstick cooking spray, put your ball of dough in it, and cover. Let sit in a warm place with no breezes until it has doubled or nearly doubled in size. When the dough has risen, divide it into 4 small sections. (you can also do one, large one with the entire dough ball but you know how I feel about mini anything!) Roll dough out into a rectangle or circle, it really doesn't matter. Divide your cheesecake pieces up if doing mini loaves. I had enough to do 3 slices of cheesecake for each of my 4 individuals. Use them all for one large one, obviously. Crumble the cheesecake up on top of the dough, sprinkle liberally with the cinnamon sugar mix and seal it up, however you want! I fold in both sides then tuck the ends and flip it over! Now brush the top with your egg wash, make two slits on the top with a knife and bake at 425 for 15-30 minutes depending on the size. When the top is golden and hard, it will be done! Immediately brush with melted butter and sprinkle on more cinnamon sugar mixture on top! 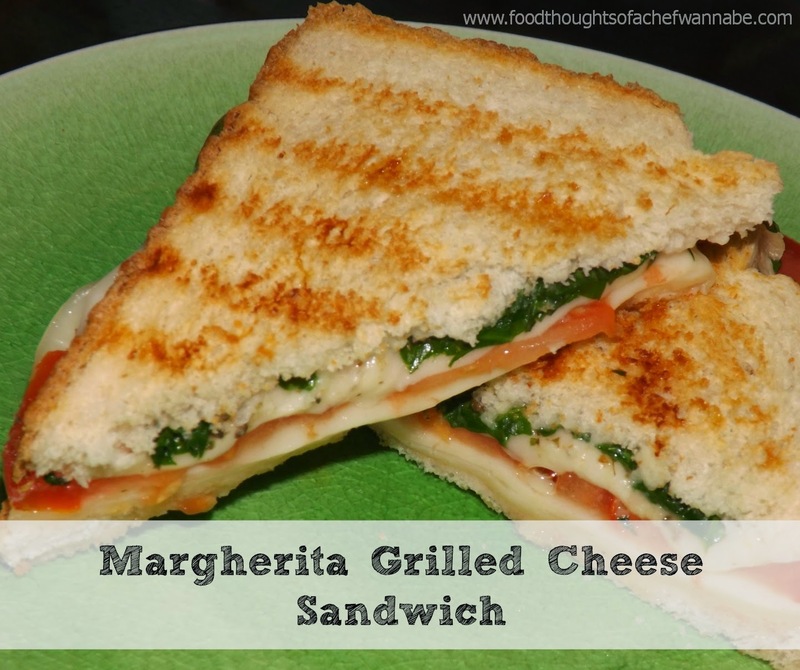 Serve these warm, OR.......put them in the freezer and serve at room temp when you need them! Allow a couple of hours to thaw. DELICIOUS! How is your summer going? Summer grillin', and chillin', I hope! It has been so humid, so stormy and so hot here! I say that as if it is any different from any other Midwestern summer! The humidity will sometimes just about take your breath away. The night I made these babies, I wanted them done on the grill. Hard to do in like, 60 mile an hour winds and ping pong ball sized hail, ya know? I did these in the oven, but as per usual, please feel free to do them on your grill, where they were intended to be! 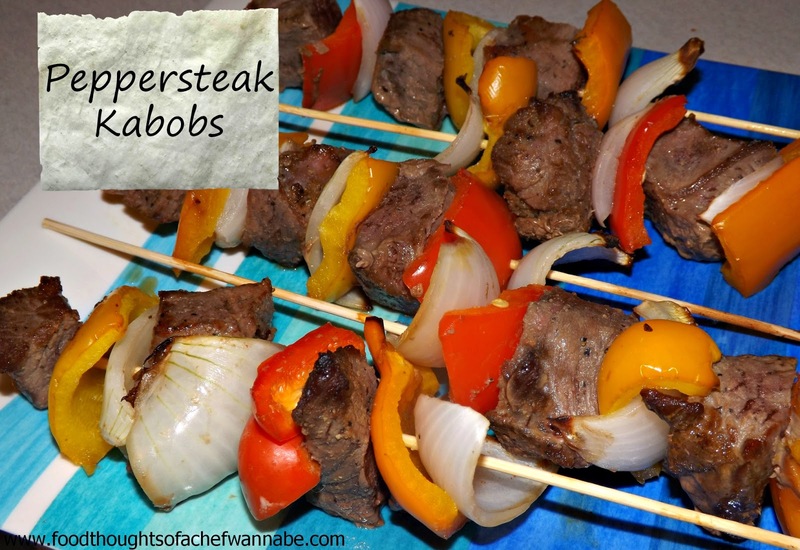 These kabobs are so easy. I have made them for so long, and just thought maybe they were to easy and run of the mill to share but you know what, sharing is caring, right? Can a "to easy" recipe really be all that bad? There is only one thing about this recipe. It insists on being made ahead for maximum flavor. They are just always a crowd please, always a success and so easy. If you ever have any leftover, chop the peppers and onions, slice the beef, and toss in a wok with a little soy sauce, cornstarch and beef stock, and serve as a stir fry over rice! Heeeeeeere we go! This will yield about 10 skewers. Or, it does for me anyway! In a large Ziploc bag, add in soy sauce, pepper, garlic, oil, and onion powder. Squish vigorously to combine ingredients. Add in beef cubes and seal it up. Smoosh to coat all meat with the soy sauce mixture. Set in a bowl or on a plate and let sit at LEAST 6 hours, overnight, or 2 days is even better! Before skewering chop onion into large chunks and separate layers and cut bell peppers into about 1 inch chunks. The only left is to skewer! Skewer on kids, in whichever order or fashion you prefer. If done in the oven bake at 425, 10 minutes, then flip and do another 10. On the grill, use your judgment, I would say about 15 minutes on one side and 5 on the other! Doesn't this sound amazing? I know! It IS amazing! My daughter in law loves all things banana, caramel, strawberry, etc. I decided to make these for her, and let her help. Or rather, let her eat the leftover filling! HA! We are enjoying spending time together, in the kitchen and out. 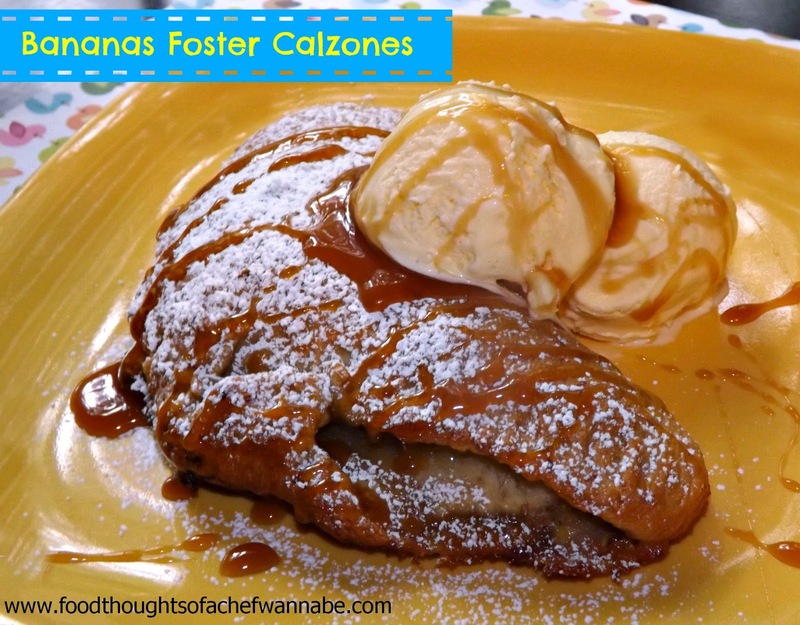 I had contemplated a dessert calzone for some time, but when I mentioned it to her she said, "OMG can you put bananas foster INSIDE of it"? Well of COURSE I can dear Kayla! Now, out of one recipe of pizza dough you will get 3-4 calzones. When you make the filling keep in mind, depending on the size of your calzones, and amount of filling you use, you may have a bit leftover. Oh darn it. I guess you could put it on ice cream. Oh darn it. Or eat it right out of the bowl. Oh DARN it. Ok, we know this is going to be amazing, and easy, but there are a few steps, so let's get started. In a bowl, combine, sliced bananas, 1/4 cup caramel sauce, salt and brown sugar. Just gently mix to combine and set aside. Divide each dough ball into however many calzones you want from each. Roll out one calzone at a time, place the filling on one side of the circle and fold the other over. Press to seal, and then use a fork to ensure they are sealed. Do this with each calzone and then place on a parchment paper lined baking sheet. Whisk one egg and a tablespoon of water together and using a pastry brush, egg wash the top and sides to help it brown beautifully! Preheat the oven to 350 and bake 14-20 minutes depending on the size. You will know when yours are done, they will be golden brown! 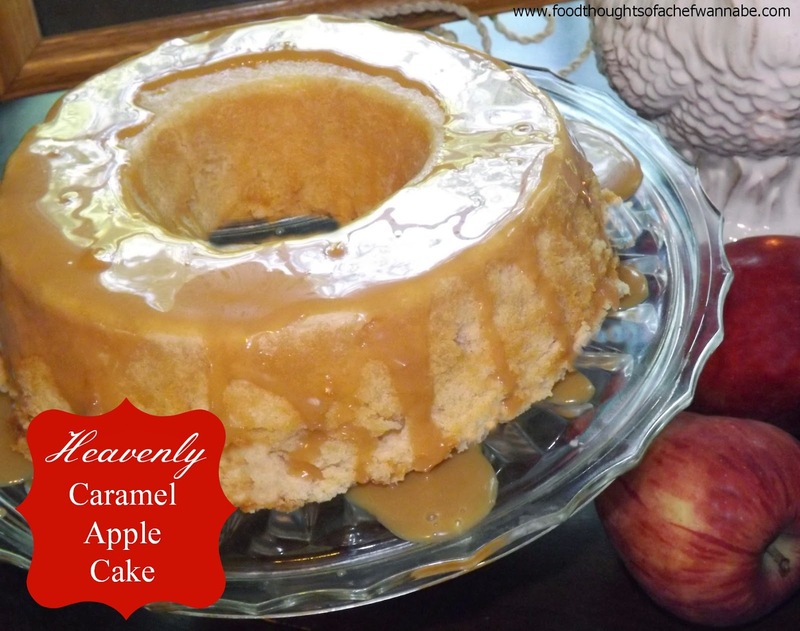 While they are cooling, combine, butter and the rest (3/4 cup) of the caramel sauce in a small saucepan. Heat until the butter is melted and the sauce is smooth. Serve calzones with ice cream and drizzle this sauce over the top and hit it with some powdered sugar! See where I didn't seal mine in the photo? I decided it was the perfect one to show you, since you can see the bananas and sauce inside! Teehee. You read it right, "Wet Nuts"! They still make me giggle like a teenager. Either because I am just that immature, or I just let my sense of humor roll most of the time. When I moved to New Jersey, my first trip to the boardwalk is where I was introduced to the ole "wet nut". Oh my gosh, I just keep laughing. Anyway, we got ice cream and my husband (then boyfriend) orders wet nuts on his. I was like, "WHAT is THAT"? I mean, let's just be honest, if you haven't ever heard of them, I know you are chuckling, and I, who tends to be a bit more dramatic at times, almost lost my marbles. I could tell he was mortified, but did it stop me? No. For days afterward, I still giggled. 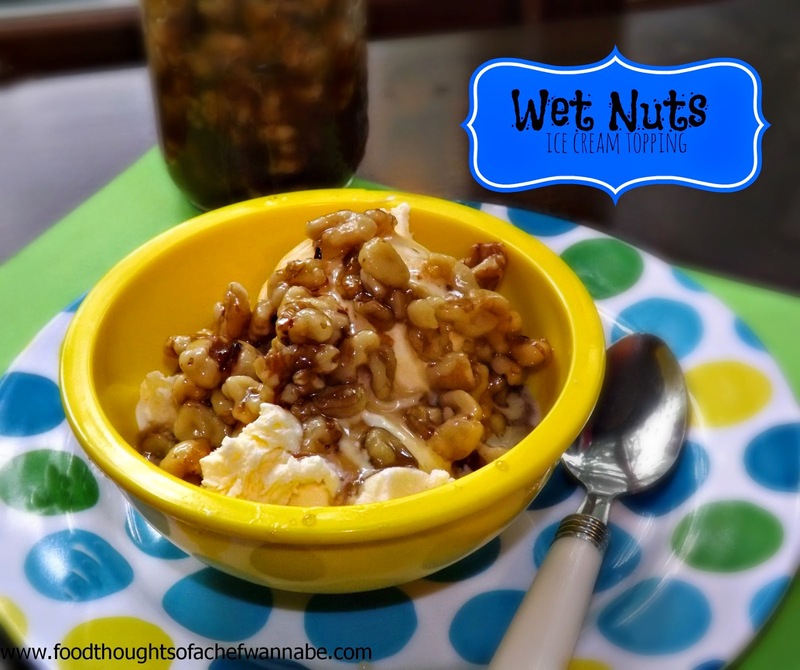 So what ARE wet nuts? They are toasted walnuts, in a syrup flavored or made from maple syrup. Now there are as many versions of this as there are people who make it. Where I live maple syrup is pretty pricey. When I tell you what I used, you might die. I used regular pancake syrup. Now for a special occasion or for guests I would use maple syrup, but for just us at home, I went with a more budget friendly choice. Oh NO, I forgot to say, this is NOT healthy. Wet nuts are NOT good for you. Hold on, I need to gather myself. Anyway, these are an Atlantic City Boardwalk tradition and I hope you enjoy them too! I think you could even put this on top of cinnamon rolls, apple pie, etc. Oh yes! Wet nuts galore! I store these in a small jar in the fridge for up to 2 weeks. 1 tsp. vanilla or maple flavoring or both! After walnuts are toasted combine all ingredients until well mixed. Place in a container or jar with a lid and keep refrigerated. Mine keep up to 2 weeks this way! Top ice cream, or anything else you can think of. Let me know what you use yours for!! Yes, you can re-read the title but that IS what it says. Oh, you guys. I don't really have words for this. My sister shared this recipe with me. She always finds the most decadent stuff! I hope to find out where she found it, if I do, I will add it to the bottom of this post! Anyway, talk about a sinful, decadent, rock your world dessert. If you love Oreo's, peanut butter and chocolate, just mix them together and this little piece of ecstasy will knock your socks off! This is a lot of convenience items, and if you don't groove on it, make your own brownie batter from scratch! It should make 18 cupcakes. If it doesn't, don't sue me, and please feel free to lick the batter bowl, eat a cookie, or lick the peanut butter spoon at will! 1 large size brownie mix, your favorite. Place 18 cupcake liners in your cupcake/muffin pan. Into each cup layer as follows.... Cookie, peanut butter, cookie, peanut butter. Do this with all of them. 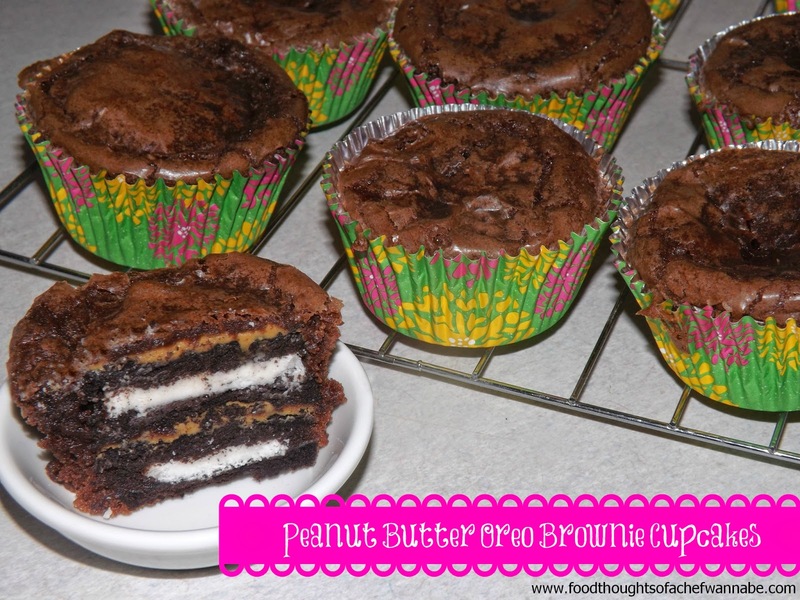 Mix up your brownie mix and pour over the top of each cookie/peanut butter tower. Divide the batter evenly among the cupcake liners. Don't worry if you think it didn't get all the way to the bottom, it will get there in the oven! Bake using the brownie mix directions! Let these cool 15 minutes before serving. Heaven, pure heaven. These freeze beautifully, they keep for several days in an airtight container although let's be real, they aren't going to last several minutes, let alone days. P.S. Should you happen to have brownie batter leftover, just bake it up like a cupcake! Potato salad. There are probably as many recipes for it as there are people in the world. I rarely meet one I like. Is that un-American? I am not a fan of mayo infested foods. Not a fan of mayo in general. I love this potato salad. As per usual, there is a story here. 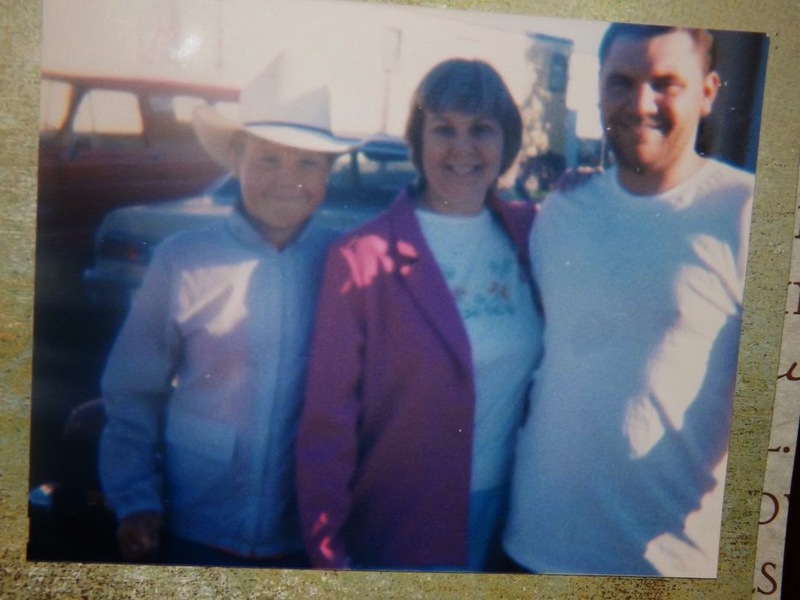 My husband has lost both of his parents. His mother's joy was her children. 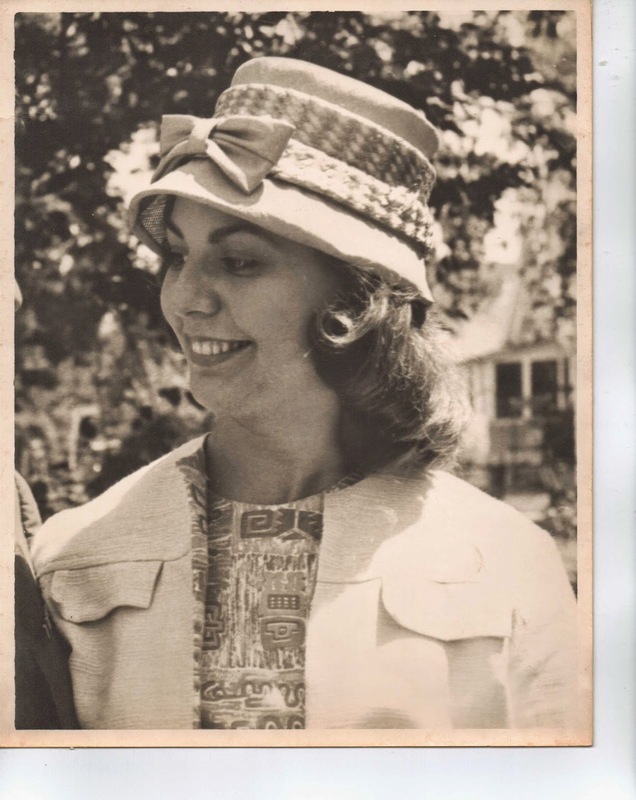 (as was his father's) My husband jokes that she wasn't always the greatest cook, but she worked harder than any chef ever could! There were many things as you can tell if you read my blog regularly that I have attempted to recreate. Some things were a success and some things like that darn Blueberry Duff, weren't so easy! When I recreate food that George's mom made for him, it makes his heart and soul happy. He misses his parents immensely and fishing and drawing are what reminds him and fills his heart with his dads memory, food and polyester pants with the seams already sewn in the front makes his heart chuckle with his moms memory. He just cracks me up. This potato salad was his absolute favorite. His mom never left the recipe with anyone. He has been asking me to try and recreate it for years, but I needed him to help me since he is the only one who remembers what it tasted like. We got to work on his day off and started with the ingredients he was sure of, which was all of them, but we had no measurements. Well friends, we nailed it, I am told. I think he had a tear in his eye when he took the first bite! This is a fairly creamy potato salad, AND, it has a sweet background. This may or may not be your kind of thing, but it is Donna's recipe and that, my friends, isn't to be messed with! This make a large batch, which is the only way she ever made it. So when you see the amount of sugar it calls for, don't pass out, remember it for 5lbs of potatoes! 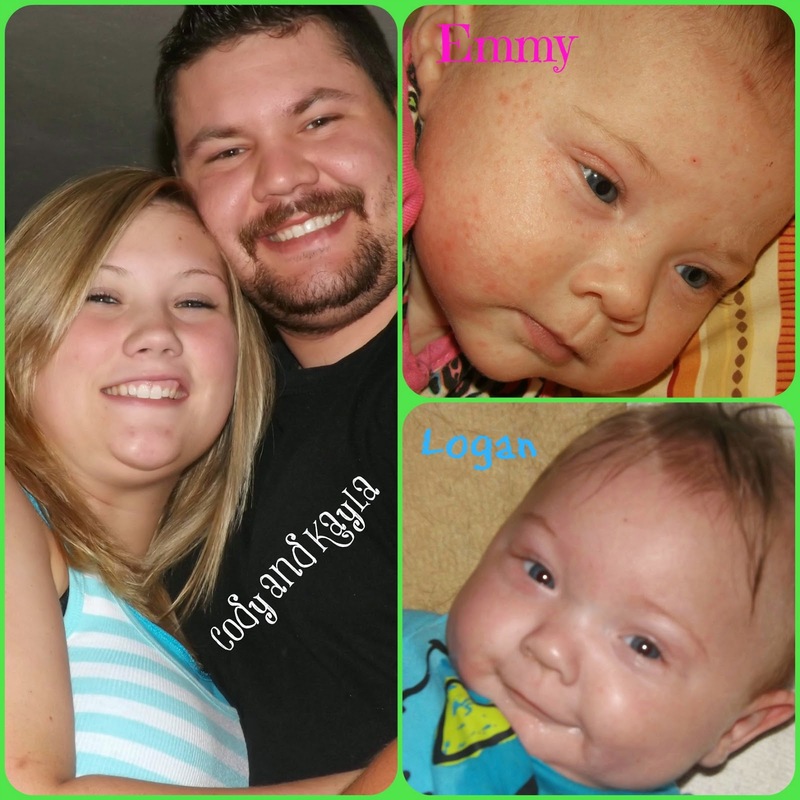 Geo's little brother Steven on the left, Donna in the middle and my handsome hubby on the right! South Dakota, Ellsworth AFB where my husband was stationed about 1988. The biggest "secret" with this potato salad is that you MUST add the potatoes to the sauce while they are warm. Also, only Hellmann's will do! You MUST! 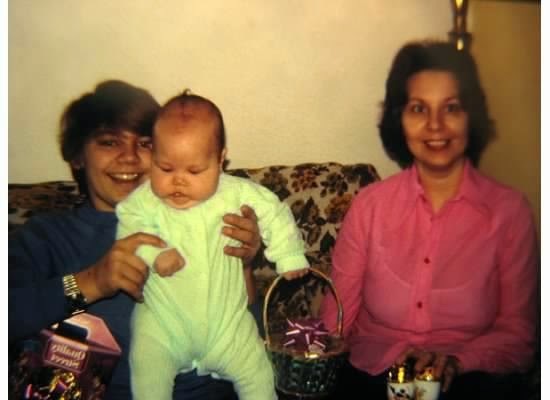 George, his baby brother Steven and mom, Donna. You can literally see my husband's memories on his face as he smiles with every bite. That, my friends, is success! First things first. In a LARGE bowl, combine all ingredients, except potatoes. Use a whisk and whisk until everything is incorporated and creamy. Next, peel and cut up your hard boiled eggs. Put those in a separate bowl. Set aside. Peel (or don't) your potatoes and cut them in med-large chunks. Place into a pot of COLD water. When you are done, put it on the stove and cover until boiling. Uncover and let boil until potatoes are fork tender but don't fall apart. Drain WELL and then immediately put into your bowl of sauce, toss in the egg and mix until the salad is well combined. Cover and refrigerate at LEAST 8 hours. Yes, I said 8. Overnight, or 24 hours, is even better. It may seem like to much sauce in the beginning but the potatoes will soak it up, and remember it IS a creamy potato salad anyway! I hope you enjoy the now, not so secret recipe. 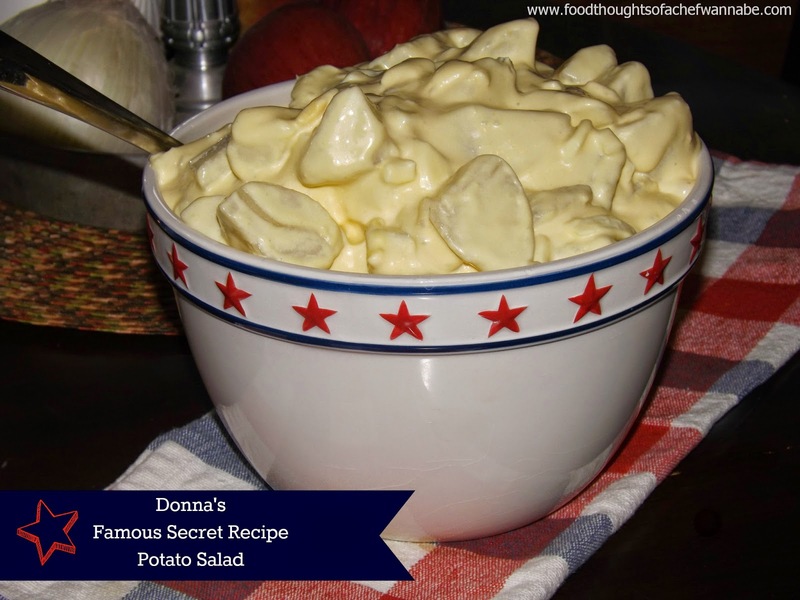 I know Donna would love that we were sharing her potato salad with the world! It was her "thing" and she was always asked to bring it places. Thanks for reading, as always and my gratitude and love to you all!